Singapore is not usually the first to come to mind while picturing a green city but the new Gardens by the Bay may change that. Opening this past June, the garden’s feature everything from boardwalks and lakes to conservatories and solar Supertrees while taking an environmentally friendly approach. Built on 101 hectares of reclaimed land, they are split into three sections: The Bay Central, Eastern and South Gardens. The Bay Central Garden is still under development but is designed to bridge the other two gardens. The Bay East Garden has a 1.2 mile (2km) boardwalk which lines the Marina reserve. It is designed as a series of large tropical leaf shaped gardens with various themes though this is only an interim garden. There are plans for future development based on a theme of water. The Bay South Garden is the largest and most complete section of the garden. 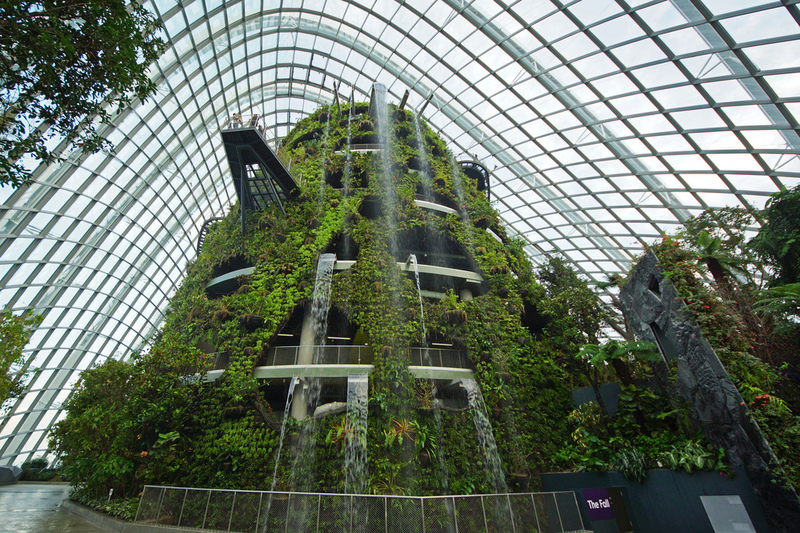 It features two conservatories: the Flower Dome and the Cloud Forest. Both conservatories are designed to be energy efficient showcasing sustainable building technologies, however each conservatory showcases a different landscape. The Flower Dome replicates a cool dry desert climate, similar to that of California and South Africa while the Cloud Forest houses a tropical highland environment and has the world’s tallest indoor waterfall. 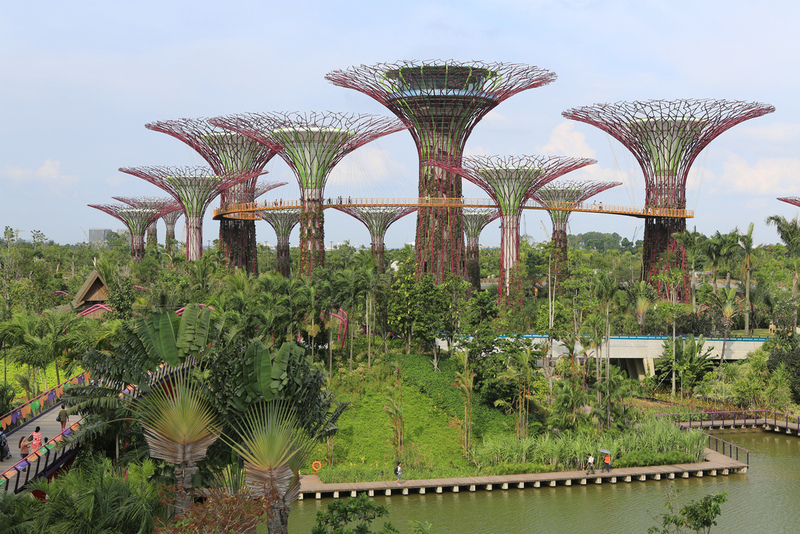 Also located in the Bay South Garden is Supertree grove. These tree like structures stand up to 165 feet (50m tall) and have a “living skin” created out of plants. Several of the trees also have solar panels to power the lighting for the trees. You can also enjoy a stroll on the Aerial Walkway that links these giant trees together. At night you can catch the OCBC Garden Rhapsody show where the Supertrees light up to music. Lastly, catch a ride on the Garden Cruiser Trail tram. It offers a 20 minute tour around the Bay South Garden as well as great views of the conservatories, themed gardens and dragonfly lake. Don’t forget to download your mTrip Singapore Travel Guide for your next trip to Singapore.